As our forest garden develops we are always looking for ways to increase the diversity and the number of the best performing species. This will enable more of our own grown ingredients to be available for our guests in the years to come. Fruit trees tend not to develop true to type when grown from seed. Instead they are best propagated by effectively “cloning” by grafting a piece of last years growth onto a selected rootstock. 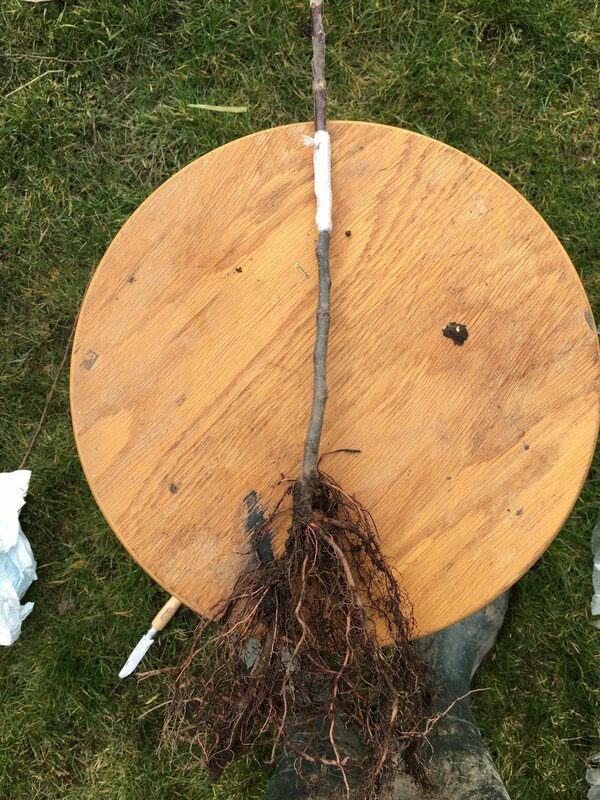 We have used this technique over the last few years to propagate more of our best apple trees and also with an interesting twist to graft pear, quince and medlar onto native hawthorn. 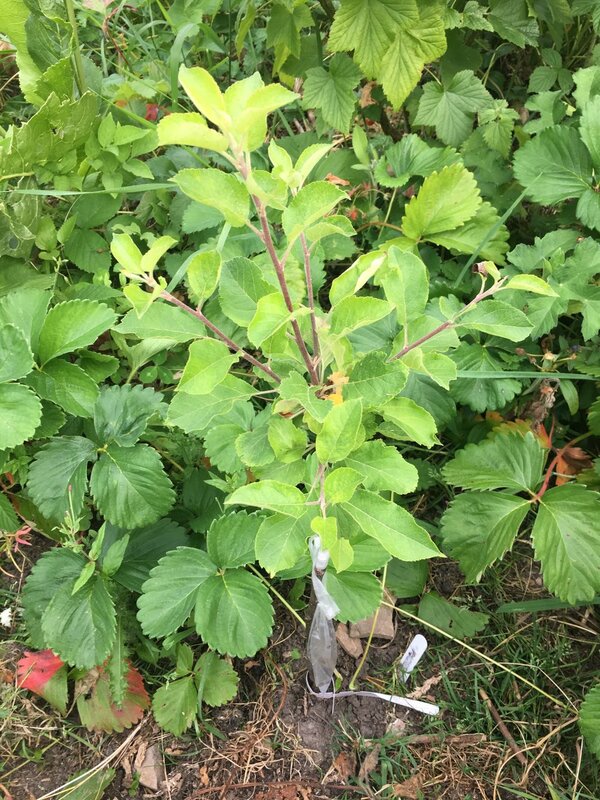 A first year Red Windsor apple having been grafted in March 2018 and planted direct into a nursery bed . This picture taken in the drought summer of 2018! The tree is quite happy surrounded by strawberries and currant bushes! The basic principle is to join a piece of our chosen tree (the scion wood) onto a suitable root stock. Root-stocks are inexpensive (a few pounds each) and best bought from specialist nurseries such as Ashridge or Keepers Nursery. The form of the graft depends on the relative size of the scion and the rootstock but I have mainly used cleft and rind grafts. Following the simple rules expounded by Stephen Hayes my success rate has been 80-90%. The pictures below show some of the grafting process. This is a saddle graft and once located onto the root stock it is wrapped tightly in strips from a plastic bag (specialist grafting tape can be used!). Satisfying to get harvests! The first apples could be expected in the third year after creating a new tree from grafting. As large areas of our plot are left fairly wild to encourage wild flowers, trees and shrubs we get a lot of “volunteer” hawthorn. It has been interesting to use these to graft to hopefully produce productive trees in the future. Being all part of the Rosaceae family Quince, Pear and Medlar can be grafted onto hawthorn. Our local hawthorn, Common Hawthorn (Crataegus monogyna) is well adapted to our climate. This was demonstrated well through the summer of 2018 where with very little rain the hawthorn nevertheless flourished. A successful graft gets a great start with an excellent natural root stock and as it’s already established gives the new plant a head start. The videos below show some of the process.